Business 9 Edition Business: A Changing World is the fastest growing introductory business programs on the market, and for a simple reason: it carefully blends the right mix of coverage and applications to give students a firm grounding in business principles. 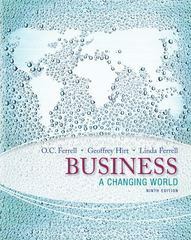 Where other books have you sprinting through the semester to get everything in, Business: A Changing World allows breathing space to explore topics and incorporate additional activities important to you and your students. Built from the ground up, Business: A Changing World is for faculty and students who value a brief, flexible, integrated, and affordable resource that is exciting, applicable, and happening! What sets this fastest-growing learning program apart from the competition? An unrivaled mixture of exciting content and resources blended with application focused text and activities, and fresh topics and examples that show students what is happening in the world of business today!